Cold weather leather jerkin. String vest. Wool pullover. Towel. Holdal with tooth brush, foot powder, soap dish, mirror, comb, laces, button stick, knife, fork, spoon, razor, shaving brush, blades and shaving soap stick. 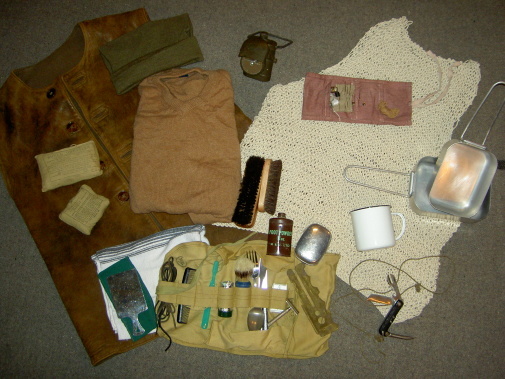 Wool cap, clothes brush, boot brush, Shell and first field dressings, mess tins, cup, housewife (needles, thread, buttons, wool), torch and marlin spiked knife.